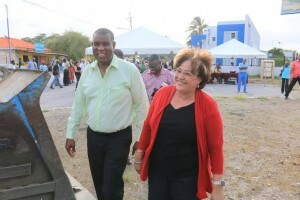 WILLEMSTAD - The People’s National Party (PNP) wants Suzanne Camelia-Römer to remain at her current post as Minister of Traffic, Transportation and Spatial Planning. The party wants to appoint Ornelio ‘Kid’ Martina as the new Minister of Justice. This was decided by the party members yesterday during their meeting. Party leader Humphrey Davelaar said that he will abide by this decision. Earlier it was mentioned that he was the candidate-minister of the post of Traffic, Transportation and Spatial Planning. Davelaar will remain in Parliament. Davelaar is currently the President of Parliament but will have to make way for a MAN MP. MAN is still debating who will be the next President of Parliament. Now that the PNP made this announcement all the candidate-ministers are known. They will have to go through a screening. The four parties are now working on a coalition agreement.